Uninspired is more like it. A few years ago there was lackluster spirit-possession flick called THE UNBORN that had a Jewish-occult POV, dybbuks and all that. This is similar, right down to the sense that the details will fade from memory before long. I must say, though, it has taken a while for expressly Jewish mysticism and religion to come out of the temple and be hamburger-ground by Hollywood into mass-peddled horror schlock. Next up, TORAHS OF TERROR. Or ABRAHAM, JUST PLAIN OLD ABRAHAM – VAMPIRE SLAYER. Is this the price we pay for Kabbalah becoming the new cool cult of the film folk over Scientology? 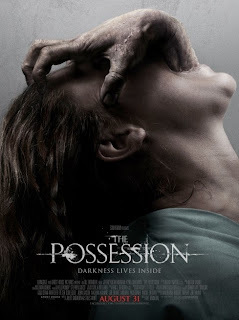 At least THE POSSESSION (besides being a true story, obviously) has some good acting going for it (then again so did THE UNBORN). Jeffrey Dean Morgan, doing a nice regular-guy performance, is newly divorced dad Clyde, having melancholy visitations with his two daughters when he takes them to a yard sale. Among the $55 worth of purchases (oy veh! I would heff offered $25 take it or leave it) is a mysterious antique box with Hebrew inscriptions. Obviously never having seen HELLRAISER, Clyde lets his little girl Emily (Natasha Calis) take the artifact.Very soon Emily starts experiencing mood swings, eerie silences, strange bodily mutations, cruelly manipulative behavior, talking to invisible entities, shutting herself in the bathroom and putting her fingers down her throat, and outbursts of ferocious violence. Sounds like a typical American adolescent girl to me - but it’s actually the baleful effect of the crate’s occupant, a “dybbuk,” or Jewish demon. Probably the one who runs show business. Clyde figures out Emily is being possessed by the dybbuk, thanks to the internet (if there were any justice, the online-research horror gimmick would have been outlawed after Art Bell’s cyber-cameo in I KNOW WHO KILLED ME; watch for that, you won’t believe your eyes). And he attempts to secure assistance in the NYC ultra-Orthodox community in performing a Jewish exorcism. You know what a Jewish exorcism is? That’s when they try to lure the demon out using diamond necklaces, fur coats and a Barbra Streisand album. Oh, wait, that’s a gay exorcism. The Possession was very creepy at parts, particularly when the girl saw the fingers in her throat. Even worse is seeing it on the CAT scan! I watched it with a few of my Dish coworkers, and there were quite a few jumpy moments. I plan on seeing it again soon, so I’ve added it to my Blockbuster @Home queue so I won’t have to worry about paying for another movie ticket. I’ll have some time to look for other scary movies too! Oh, I forgot to mention, after the movie I found a set of ear buds in the parking lot. So the experience wasn't a total loss. Or it was, considering I subsequently found two pair of ear buds in a recycle bin at work.